I'm not sure about your machine, but all of my motors have a plate that tells you what the amp draw is. If you look at the image above you will see AMPS. Next to that you will see 18/9. That means that the motor will pull 18A if configured for 120V, else it will pull 9A if set up to use 220V. I have bought two Hammer machines from the California office, and came away with a "not so great" feeling about their attitude. I tried dealing with Delaware, but they decided that Louisiana was in the "west", so Calif. it was. I dealt with a salesman that may no longer be there, and I don't remember his name. At that time Liz was an assistant to the sales team, but was always so cheerful and friendly that I wished that I was dealing with her. On my second purchase a few years ago the salesman basically did not ever get back to me with answers to question for weeks, and I ended up with Fergus (whom I thought was a manger or senior sales). He acted like he was doing me a favor, and wouldn't honor the price I was previously quoted by the guy who went AWOL (although I had it in an email) because it had been several weeks (while I was waiting on answers to my questions). Fergus basically talked to me like he was doing ME a favor. I finally got the machine for an in-between price, and haven't looked back. Since then Liz has become a salesperson, and does a nice job of touching base a couple times a year by email. Last week I had problems logging in to their website and had to reset my password. The next day I got an email from "Sam" in Dallas noting that he saw me setting up a new user account, and offering to answer any questions I might have. My first response was 'WHAT", but instead I politely responded that I was just resetting my password, owned 2 machines already, and was being taken care of by Liz. He responded very genuinely, apologized for the mistake, and let me know that territories are being re-assigned since Dallas is now up and running and closer to me. I think that some of the Germanic stubbornness from Felder in Austria must rub off on the US offices a bit. In the 70's I raced Penton motorcycles, which were made by KTM in Austria. John Penton (from Ohio) spent 10 years building the bike of his vision, and hired KTM to do it. He almost went to blows with Eric Trunkenpolz (the T in KTM) many times in getting the bikes built. Felder/Hammer makes great machines, and they do it their way, including the sale. So if you want their equipment just muddle through. In the long run the sales process will become just a memory, but the machines will literally be there forever. As for the sawstop question. I went through a similar process. My hand surgeon (I had arthritis) was adamant that I get a sawstop. The euro sliding saws are just as safe in a different way. If you leave the riving knife/dust collecter chute on then your hands never come near the blade. The riving knife nearly eliminates kickback, and if using the table it is eliminated completely. The dust collection is pretty darn good compared to a cabinet saw, so much better on your lungs. And last - you mostly stand to the left of the saw, not behind it - so you are much more protected from the dust and projectiles that do come out of the machine. As far as motor and loads go if the saw draws 18 amps on 220V it should by code in both the US and Canada be wired into a 30 amp circuit using 10ga. 20 amp services runs a 12 gauge wire and should only be loaded to 75% to 80% of rated capacity, so by code you can run 16A rated motors on this circuit. Will the motor run on a 20 amp circuit, yes it will but an inspector will slap your wrist and so might your house insurance if there is ever a problem. All good electricians know this. Man, what a post!! Thank you very much for all of that information. When I was reading your comments I kept thinking 'He's in Louisiana, so why's he not working with the Dallas dealer? ', but you cleared that up. Also, this makes the third or forth time that Liz is mentioned. You may or may not know this, but I have an email waiting to be sent to the Senior Sales rep in Delaware and am teetering on whether to purchase another brand or as you said just 'muddle' through it all and be done with it. I am also wondering if I should just wait for a Sale to come up which may be soon and save some cash? I recently read a post somewhere which noted that Felder/Hammer rep's had a very 'teutonic' attitude in dealing with their clients. My Funk & Wagnal defines that (in so many words) as 'very German like'. That pretty much mirrors what you noted. Quite honestly, years ago I trashed the riving knife and the blade hood of my TS when I began making/using my own sleds. That was years ago. I have a deep respect for all power tools that cut, but riving knives do not work on TS due to the back support of the sled. That said, just as you noted, standing off to the side of the slider is just a safe as using a SS. And, as I noted earlier, the 12-inch blade of a K3 would allow me to get rid of my RAS and my TS which would 'expand' my shop. You have given me much to ponder. Thank you very much for all of your comments. I'd suggest calling Liz and asking what she can do to help. Their sales are oriented around the seasons, and sometimes feature machines while other times are accessories (usually winter I think). I thought there was a sale going on now - check their "eshop". it shows the sales price when their is one. They ALWAYS have some sale going on. So often that they may as well just lower the prices! If you are or become truly fed up, you might consider SCMI/Minimax. If so get in touch with Sam Blasco. If you are processing logs you will likely be happier with the MM16 or MM20 than the N4400. The MM series saws are built by Centauro in Italy and are heavier than the X10 series Felder saws (similar to the X40 series) and heavier than the ACM built Laguna, all of those saws are a step up from the N series Hammer saws. I always thought the N4400 was a good buy when you could get it for under $2k but much less of a deal now. I know less about the differences between the Hammer vs Minimax sliders. I send my aforementioned email to the Senior Sales Rep in Delaware and respectfully request that he hand me off to Liz if he wants to make the sale. I think that the latter approach may be the correct one. With S/H that looks like a $10K price tag. Holy cow! Where you been the last few days? I just found the Minimax website and am now watching a video with Sam showing off the MM16. This may just solve the Hammer drama, for the bandsaw anyway. Valid points, all of them. I tend to have more confidence in a product when the purchasing and delivery experience is pristine. Companies that have messy showroom floors, poorly designed websites, and train-wreck phone systems do lose business even if they have sought after products. In this day and age businesses have ceased to exist for more trivial shortcomings. As the years pass by I've found myself having more responsibilities and less time outside of them. Time in the shop for me is, or needs to be, therapeutic. Buying tools is an extension of that activity for me so added frustration or stress becomes even less desirable and as the dollar amount climbs, so does the reward or consequence of the activity. They say an happy customer may tell a friend about his experience but an unhappy customer will tell 10. Real bummer for Hammer/Felder. I was on the verge of ordering a planer but now I think I'll try a little harder to look around and find some alternate choices to consider as well. Very well said and my thoughts exactly. My email to Mr. Maynerich has been sent. I noted to him that it has been over a week and have yet to receive answers to the questions I requested on 6 March. I will provide an update to all of this when - or if - I hear back from Mr. Maynerich. Your reasons for not purchasing a SawStop are all weak at best. The reality is you want the Hammer, which is a completely different saw with a different design and capabilities. I'd buy the Hammer over the SawStop without a doubt. You know, this may be a case of the grass is greener.... I was shopping for a J/P last fall and more recently a bandsaw. It was down to MM or Hammer in both cases. Customer service was an important aspect and frankly, I found shortcomings from both. Not my own experience but simply scouring for posts on forums, owners groups, etc. I think the hobbiest is the most difficult customer for them to cater to. They expect more personalized service, need more education/information, spend less money, and expect a new car delivery experience (white glove delivery, no scratches or cosmetic blemishes). Those might be lofty expectations for a company peddling industrial machinery. I'm not sure either one excels, however, both build very good machinery and your alternatives may be asian imports assuming you're buying new. One thing that was puzzling is it seems getting replacement parts from either one is challenging. How can they successfully support these machines in a commercial environment if that is the case? But if you've had a european car held hostage by the body shop due to parts availability, this wouldn't surprise you one bit. In the end I went with the Hammer J/P and MM16. It has not been put into service yet, hopefully this spring if everything else lines up. I saw the N4400 at a recent woodworking show and it didn't strike me as being built any better than a Laguna 14bx, but unfortunately it wasn't connected to power so that's as far as I got with it. The MM16 has a pretty decent following and seems to have earned a (good) reputation. Similar to an Italian car, it's got some niggling issues like a door that swings into the wheel or a history of bad switches, but on the whole, it appears to be a stout saw, but not in the same price or quality bracket as the N4400. I think the baby Felder is more comparable. I wish it was possible to perform a hands on demo of each of these prior to committing. In terms of my own experience with either company, no issues getting quotes or information from either. Both seemed to have all the common information requested by hobbiests (buying sight unseen) right at their fingertips. You just have to sift through the copied and pasted information, watch the videos, click the links, but it's there. I didn't have to deal with shipping from Felder since I picked up at the warehouse. The guy in the warehouse was very helpful and friendly and even took the machine back out of the truck to load it onto a standard pallet once i realized my pallet jack couldn't handle the mini pallet the machine was loaded on. He also helped me strap the unit down in the truck. My minimax hasn't shipped yet, but I've read they come shipped on their spine rather than upright to minimize potential for shipping injuries. The freight charges appear to reflect that. I was in touch with Sam during the purchase process for the J/P and he was helpful. That's the main reason I returned to him when looking at the bandsaws. I could have picked up from the Felder DE office, but I liked the MM16 and wanted to give Sam some of my business since he was so helpful. In addition, it's quite clear Sam doesn't just sell the saws, he's been using them for some time (I didn't realize this when I first contacted him about the J/P). So if I have an issue, I can go back to someone that is intimately familiar with them. Good luck. Hopefully all this will be behind you soon and you can enjoy the new equipment. As I noted earlier, I have a friend who enrolled at a woodworking course in Santa Fe and they used SS table saw's exclusively in the course. My buddy said the SS sensor had to be tweaked everytime they changed blades. In addition, if you want to use a dado set you have to change out the aluminum brake and install the optional dado brake. He said they always succeeded in getting the machine back in operation, but it was a pain. His words were the SS is a 'high maintenance' machine. In terms of safety, I think the Hammer is every bit as safe as the SS, but in a different way. I won't argue that the SS can save fingers (or sausages), but this woodworker has great respect for sharp rotating blades especially TS blades. That said I had an experience yesterday that made me really want a TS with a long slider. I am making a new 3-inch bench top out of maple and a slider would have made cutting the heavy maple planks a breeze. I had to resort to using my TS75, but support wise, slicing the last 3-inch section was a bit iffy because the plank was slightly twisted. Using a TS with a long slider would have been perfect for the task and taken much less time to accomplish. And, I think safer as well. In addition, the Hammer utilizes 12-inch blades. A TS with that capability would enable me to do away with my 12-inch RAS and my TS which would give me a bit more room in my shop. While agonizing over all of this I have wished that I could 'buy American', but when spending this much moola I want to get the biggest bang for my buck. LOL "SawStops are high maintenance"! Ha ha thats just silly. They're no more than any other good table saw. Swapping out brakes takes about 30 seconds. Itll take longer to pick the blade or setup the dado stack. The MM16 has a pretty decent following and seems to have earned a (good) reputation. Similar to an Italian car, it's got some niggling issues like a door that swings into the wheel or a history of bad switches, but on the whole, it appears to be a stout saw, but not in the same price or quality bracket as the N4400. For clarity sake the switch issues were shared by the S45 and the MM16 but were traceable to a single batch of switches and has been rectified for over a decade. There were also some issue with some of the 50hz Italian motors but also rectified. The S45 is more of a competitor for the N4400 but with a higher European part content. Minimax doesn't sell many of the S45n bandsaws in the US due to being fairly close to the MM16 price. The S45n is built by SCMi not Centauro. The bottom door hitting the mobility kit wheels is still an issue with all the MM saws when putting on blades near the capacity of the saw, you can add a wooden block to extend the wheels back and inch or so or use machine leveling casters if you need the saw to be mobile. I can guarantee you will not be disappointed with the Hammer. I do not have one, but have spent some time using one. You had asked about the Dallas office, so I will comment. 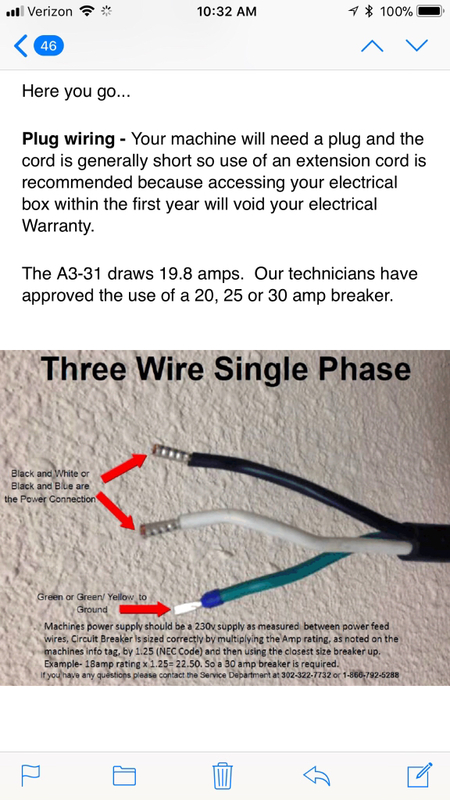 I recently bought the A3-31 from Sam Striegler and had a good experience. I saw the machine at their showroom (I happened to be near Dallas one day for business). I had unexpectedly arrived after hours, and it was actually his suite mate who kindly let me in and ran that and a few other machines for me. He has a furniture shop and is an end user rather than a salesperson, but he was very enthusiastic about their equipment. I needed a jointer and not a planer, but I liked the combo. I called Sam and told him what I was looking for, and he answered the questions I had. He was prompt at returning calls, and he actually answered one of my calls to his cell phone when he was traveling in Austria. He said he would send me a quote to review, and I was interested to sign and send it back with the 20% deposit. They had several in stock and said they could deliver whenever I was ready. I had some technical questions, mainly about electrical requirements, and he put me in touch with Brian Lester (out of Delaware, I think), and he answered those questions promptly. (Some of the written documentation calls for 30A, which I had, but some other documentation and the actual tag on the machine said to use a 20A circuit, so I had an electrician make a subpanel that they attached to the back of the A3 with magnets. Photo will be posted below). This was my first time to buy equipment that I couldn't put in my SUV, and I was worried about getting it across a gravel driveway into the garage and unloading it. They arranged shipping and told me what to expect in terms of the driver and the size of his truck. He called me 30 minutes before delivery. It arrived in good shape. He placed it in the garage for me, no problem. A few days after delivery, Sam called back to make sure everything was A-OK, which it was. Pretty much every aspect of the deal was easier than I had expected, and even the electrical issues were, in retrospect, fairly straightforward. It was very different from, and candidly, more difficult than, the usual retail experience at Woodcraft or Rockler, but my guess is they are more geared to dealing with professional shops than hobbiests and they didn't have a showroom in Houston. If Sam had sent me a quote without letting me know it was coming, it might have rubbed me the wrong way with all the legalese, but I was expecting what I got. It is a shame that you had a bad experience with their responsiveness. Had that been my experience, I might have gone a different route, but I am really happy with the machine. Here is the subpanel I had installed. Im wondering, I need to check my N4400, but what gauge wire does the wire coming out of the motor on your A3-31 have listed? First, I do understand your frustration and if you think it is just you then you are wrong because this things happen to people from time to time. Thinking about changing the brand because of sales people did not take care of you the way they should will not be a best solution and how do you know that the other company has better if not worst sales people in the show room. I have a Hammer A3 31 and the N4400 bandsaw and both of them are great machines. You would not be unhappy with any Hammer machines. I bought mine from Delaware office and I had excellent experience not only from them but also from the dealer in Canada! You might think what the heck is going on here now?! Well, I am in US but I have no business in Delaware and it is not close to me to drive there but I go Toronto a lot and I thought to go to the dealer and see the machines as well when I am there. I called the dealer in Canada and talk to one of the sales representative on the floor and I explained for him clearly that what was my plan. I told him that I would like to see these two machines but I am not going to buy it from you because I live in US and I am not close to Delaware show room to go there but most likely that would be the dealer for my area, so this is your business and if you do not like to do this for me, I have no problem with that and I understand and respect it as well. Here was his answer, you are a gentleman and I do understand your situation and would have no problem to demo the machines. Make the long story short, I was there for two hours and I got all the information I need and test drive the machines and came home then I called the Delaware office and I order the machines. When I called them and here is the fun part. I did not let the sales man even talk and I told him that anything he might want to tell me I already know, how much for this two machines shipped together and how long I should wait? The machines arrived packed excellent and on time, and even the driver told me that he has been in this business for 35 years and he never saw such a good packed item ever. I took out about 300 torx screws from this shipment and I used the wood to build a table which I use it in the garage. Well, the drama is over: This afternoon I ordered the 79x48 K3. Fast forwarding, he provided all of the information that I had been requesting within the next hour. Then he scheduled a phone call at 1300H (my time) and took care of every need that I had. And the funny part (IMO) is that he handed me back to the original sales rep, Mr. David Brooks, that I had contacted on 3 MAR. Once again, Mr. Brooks wanted to know if their was anything else he could he could do for me. He sent the contract - that I was expecting this time - and I made a few changes and sent it back. We are scheduled to conclude everything tomorrow morning. I asked for the K3 to come with a 12-inch blade installed and not the normal 10-inch blade. They took care of that no problem. I will have them toss in their dado set because I seem to do a lot of finger joint joinery (drawers and so on). Delivery date will be in April sometime. While this put a smile on my face (and a serious dent in my bank account), the fact that my two cousin's (brothers) in Santa Fe were delighted to take my trusty Craftsman TS put an every bigger smile on my mug. Cousin Ralph said he'd give me whatever I thought it was worth as they really needed a good TS. I suggested $1 and he say 'No way!' He argued. I won. It is not often that I can do something good for my family. They will come down after I get the K3 up and running and will spend a few days in my TS Training Course. . My TS includes 3-4 Forrest Thin-kerf blades and a Freud Flat-top blade. Plus my Forrest Dado set. Plus the Shop Fox mobility kit that it rides on. Now, I'm going to reveal something that I do not want repeated: This Craftsman TS is the only TS I have ever owned. I know, I know, but that's a fact. So when I think of those 'other' woodworker's who have owned several TS's I'm probably saving $$ by purchasing the K3. That's a stretch, I know. So, considering the title to this thread - How hard can it be to purchase Hammer products?, I guess the correct answer is - It depends on who your salesperson is. Everybody knows that. Right? Thanks to everyone for all of the good advice and shared personal experiences. I have learned a lot from all that has been posted. Had a large jet cabinet saw that was awesome. I split my finger in half (I was tired from 14 hours in the shop and made a stupid mistake). After some surgery I bought a SS on the chance it would help even a little should I have another "event". I respect my SS as much as my Jet and trust the safety mechanism none...just like anyone should. Every time I switched blades and do the module dance I count to 10 over and over again until I can re-fire the machine and resume fab. Just finishing my post, sorry I had to go. Overall my experience with Hammer machine and the service was very good. I like my N4400 a lot and I bought all the accessories as well. I ordered mine with ceramic blade guides and I am very glad I did. Both this machines should be wired to 20A 220v with 12AWG no exception.I asked this from manufacture in Austria not the dealer or sales people. They told me if I connect my A3 31 to 30A, the warranty would be voided so forget it. Never ask the sale people about this unless they give you a write up with signature. If you blow up your machine and your wiring was done by certified electrician, if that was the cause, you have much better chance to replace your machine then what the sales man told you to do. Just for their insurance and liability they would never admit it. IF you decide to buy the machines, let them ship it together so you can save big $$ on shipping. Try to talk only with one person not few and keep it simple. I do not have the slider but If you have any question about N4400 I would be glad to help if I can. Good luck with whatever bran you would buy. I hear you loud and clear and I'm sorry to hear about the finger. In my case, hearing all of my wife's 'comments' (after a shop accident) about not being careful enough was worse than the cut itself. One thing that I forgot to mention in my last post was the fact that the K3 can utilize 12-inch TS blades. That was the real selling point for me. Thanks for the update on your situation. Not sure if it's a coincidence or not, but after the discussion in this thread of the non-responsiveness of Felder (California), yesterday I received an email from Liz "just checking in" on me after my A3/41 purchase. I hear you loud and clear and I'm sorry to hear about the finger. In my case, hearing all of my wife's 'comments' (after a shop accident) about not being careful enough is worse than the cut itself. Haha, my wife was nurturing then really ticked. Started in on me about karma and how flipping people off all those years finally caught up to me. It was really funny in spite of the situation. Don't get me wrong, love to have one and I'd really enjoy the bigger blade. Had the need just last week. I'd like to hear it all works out for you so you can post up and tell us how awesome it is. Congratulation, I am very glad it ended up like this. You would love the machine. That's great, congratulations! Next thread will be unwrapping your "gift"!